People leaving Mile 17, Buea, Sept. 15, 2018. People fleeing the violence in the English-speaking regions of Cameroon are going through systematic searches before being allowed to enter the French-speaking regions of the central African state after the government claimed fighters were trying to enter with weapons. It is very busy here at the Mile 17 bus station in the English speaking Southwestern town of Buea, where at least 30 transport buses leave daily for either the French-speaking town of Douala, or Cameroon's capital city, Yaounde. Many people remain at the station, some with their mattresses, dresses and kitchen utensils, expecting more buses to arrive and transport them. Gabriel Mbinkar, an official of a bus agency says they have doubled fares from $8 to $16 because their vehicles return from the French-speaking towns empty, since many people are fleeing English-speaking towns and villages and no one is coming in. 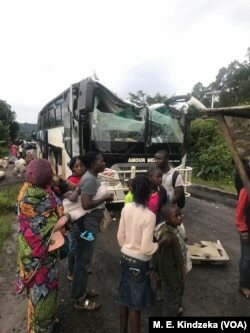 "As you will see behind me passengers are there, waiting for vehicles, the vehicles that were there this morning are already gone and we are trying to see what is available if it can get these people by the latter hours of the day so that they can go out in order for people not to fall into trouble," said Mbinkar. Among those leaving is businesswoman Philomena Maloke. She says the military searched her luggage and that of her two-month-old daughter at least seven times between Kumba, her town of origin and Buea where she arrived Saturday to continue to Yaounde. "It is a pity that it is happening here in our country," she said. Bernard Okalia Bilai, governor of the English-speaking Southwest region of Cameroon visited the Mile 17 motor park Saturday to plead with people to stop the mass exodus. Governor Bernard Okalia Bilai guarded by military pleads with people not to leave, assuring them of their safety. He says people are running away because of threats from separatist fighters to disrupt the October 7 presidential election, and because of rumors the military is planning raids against the armed separatists that invaded many towns in the region. "There is fake news that the army will attack, will launch an attack, no, the army is not launching attacks," said Bilai. "The army are there to protect the population and their property. Those who are abandoning their homes, you can see here, we have beds, furniture, no, where are they going. No, we want them to stay at home." The governor of Cameroon's English-speaking Northwest, Deben Tchoffo, says thousands are also leaving his region. He says the military has seized weapons some suspected fighters were hiding in their luggage as they left for French-speaking towns. Tchoffo says he is making an appeal for every one travelling to verify their luggage to make sure traffickers are not hiding weapons in their bags. "I will like to launch an appeal here to ask them to collaborate with security services. To denounce those that are threatening them to the security services, so that together, we fight to bring back the situation back to normalcy," he said. A bus attacked by armed separatist is seen at Akum, a village 10 Kilometers from Bamenda, the capital of the Cameroon's English speaking northwest region, Sept. 9, 2018. Unrest began in Cameroon in November 2016 when English speaking teachers and lawyers demonstrated against the overbearing use of the French language. Separatists took over and started demanding the independence of the English speaking from the French-speaking regions of the bilingual country. The separatists have on social media insisted that they will disrupt Cameroon's October 7 presidential election in the English-speaking regions. They say they are an independent nation called Ambazonia and will not allow such an election in their land. The government is assuring the people of security.